All Eco Furs products are tufted by using Scandinavian Rya Rug Sewing Technique. The technique is a very simple yarn knot created into fabric with a needle. The knot is repeated - one by one - to cover the base cloth with rows of them. I'm going to show you very shortly how the knot is made. You can then test it yourself during a lazy day in the sun and see if you get bitten by a Rya sewing bug - like the Habitare 2011 visitors did at my Traditional Scandinavian Rya Rug Sewing Technique Workshop last September. At the workshop I taught to five 10-student-groups - including among others 3 Finnish Politicians and their assistants, a glam rock band Flinch, Michelin Star Chef Jouni Törmänen, Textile Designer Sari Syväluoma, Fashion Designer & Finnish Project Runway Finalist 2010 Maria Jokela, Finnish Association for Mental Health staff members and many, many other expo visitors - how to sew the knot and then all had a chance to take part in tufting one of my new designs back then, a birch trunk inspired neck cushion that was launched at DesignShopOutlet.com during the expo. Lads from Flinch did excellent job! Finnexpo and Finnish Association for Mental Health staff were so excited about their new tufting skill that it was really difficult to kick them out of the class at the end of the hour that was allowed for each group. Finnish MEPs Anneli Jäättenmäki and Riikka Manner and Member of Finnish Parliament Elsi Katainen were listening carefully my demonstration before throwing themselves in to sewing. And here Elsi is proudly presenting her first completed row - beautiful work, well done! The day's work resulted in a 90cm long log cushion that was sold to Tapiola Group in the same evening for fabulous €5000 price. The money in full was donated to the Finnish Association for Mental Health to help young people with mental health problems. Below the Tapiola Group's Markus Savolainen, who was among the seriously bitten ones - in a good way though. He also got an honor to bring the cushion to its new home at the Tapiola Group HQ. From left Markus Savolainen, Sinikka Kaakkuriniemi and Tarja Heiskanen (Finnish Association for Mental Health) with myself. 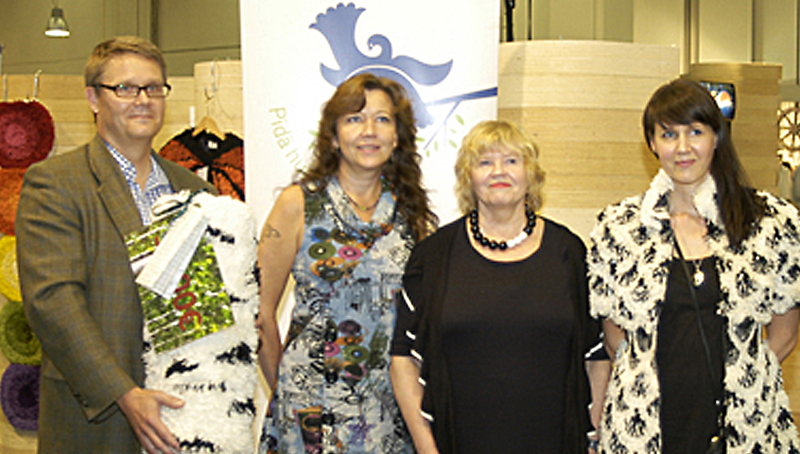 The event was hosted by DesignShopOutlet.com and generously sponsored by Fiskars (scissors), Pirkanmaan Kotityo Oy (yarns) and Heli (other cushion materials) and it was organized in collaboration with Finnish Association for Mental Health. - Now it's your turn to dive in the fascinating world of Rya sewing! You need a piece of loosely woven canvas fabric. For example sack fabric is excellent for this purpose. Start sewing from the left bottom edge and proceed to the right. Next row will be sewn above the first one. Leave 1cm-gap between the rows (about 4-5 weft threads' up counted from the first row). To achieve straight don't fall of the track between the 2 weft threads.